Eating vegetables is hard. We all want to wake up, workout, eat 3 healthy meals, take care of the kids & have some alone time, all while getting 8 hours of sleep every night – but let’s be honest, that’s a far away fantasy for the most of us. Work gets in the way, things come up when we least expect it, and we often find ourselves just trying to make it through the day without pulling our own hair out. Trying to get everything together to plan and eat nutritious meals can be incredibly stressful – especially when your kids won’t touch vegetables with a 10-foot pole. At Chefs Plate, we think that eating well is something that shouldn’t be overlooked, because not only is it important to the health of your kids it’s also vital for the well-being of the planet. With Earth Day right around the corner, we’re really trying to emphasize the importance of sustainability, and the deliciousness of the produce that comes from responsibly farmed soil. We’d really love for kids to learn about the benefits of greens as early as possible for both the body, and the earth, so that they can grow up and preserve the planet’s beauty for many future generations. What we’ve done is gathered some great, green recipes to enjoy with your kids this Earth Day that won’t leave them picking at their plate. There’s nothing better to start the day off than pancakes, and we’ve got a recipe that makes delicious green ones! Add all ingredients to a blender. 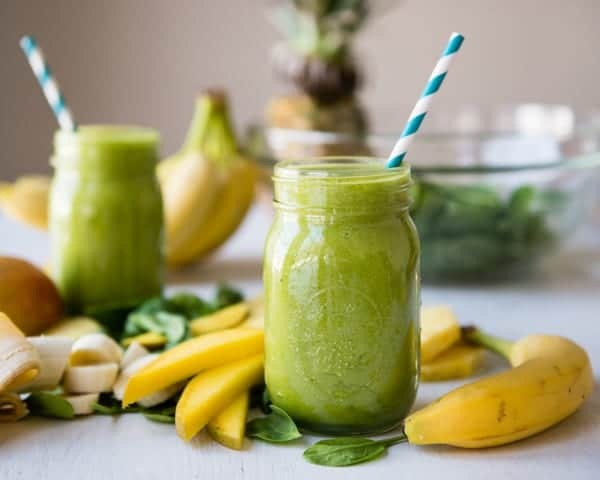 Blend on high until very well combined, about 20-30 seconds, or until you no longer see any noticeable flecks of spinach. Warm a nonstick or cast iron skillet or griddle over medium heat and coat with oil or butter. Pour small rounds of batter onto the hot surface and let cook until bubbles form on the surface and the surface is mostly set, about 2-3 minutes. Flip and cook for an additional minute or two, or until fully cooked. Continue to prepare the rest of the batter, keeping the finished pancakes warm in a 275 degree oven if desired. Next Up – Smoothies! They’re a quick and easy way to pack your body full of nutrients, and a great way to add some vegetables into your child’s diet (or your own). Place all ingredients into blender and blend on high for 1 minute or until all the ingredients are combined and smooth. Add a bit more milk if the mixture is too thick. Here’s a neat trick – pour the mixture into a popsicle mold and put in the freezer, for those hot summer days! Finally, we’re going to show you how to make a mouthwatering broccoli pesto, which, when poured over some Conchiglie (seashell pasta) makes for an irresistible weekday dinner. In the bowl of a food processor, combine broccoli, basil, and oil and pulse until combined. Add Parmesan, almonds, garlic, and salt and blend until combined. The taste is unbelievably fresh and vibrant, and look at how easy it was! These recipes are a fantastically simple way to get your kids enthusiastic about eating green vegetables, & teach them about Earth Day, while also helping them develop healthy habits to build a sustainable future!